I found a recipe last Fall in my Fix-It and Forget-It Cookbook for German Potato Soup. I was looking for a potato leek soup to use some aging leeks. This recipe appealed to me because it had cabbage, which meant I could substitute in the lactino kale and it didn’t require me to purée anything into a smooth soup. 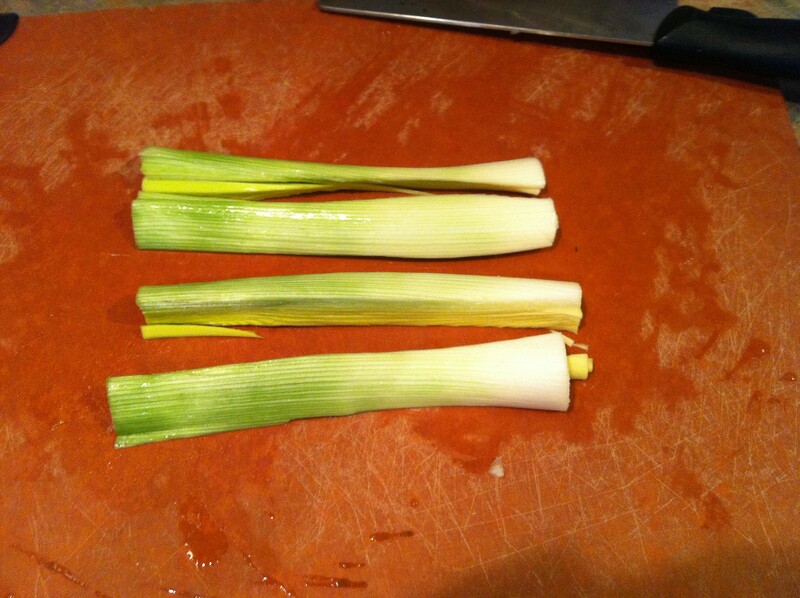 I like to quarter the leek, then slice it into 1/4″ slices. Combine all above ingredients in crock pot, cover and cook on low for 8-10 hours, or on high for 4-5 hours. This recipe is great because you can substitute freely. The first time, I used kale and left over beef roast. This time, I used Swiss chard (greens and those lovely yellow and red stems) and left over smoked pulled pork from the weekend. Add corn bread goldfish, and we had a festive Christmas Eve dinner. The original recipe had bacon and parsley, ingredients I did not have in my house that day. This was a great clean out the crisper recipe. Mashing the potatoes and adding them back gave the soup a heavier, smooth texture and the sour cream added the extra wow! factor (and is probably what makes it “German” potato soup). Living in Eastern Washington State for the past 15 years, I appreciate the wonderful produce we have available here. I am a working mom, with the typical active family. We have two children, a cat, a fish, and a snake. 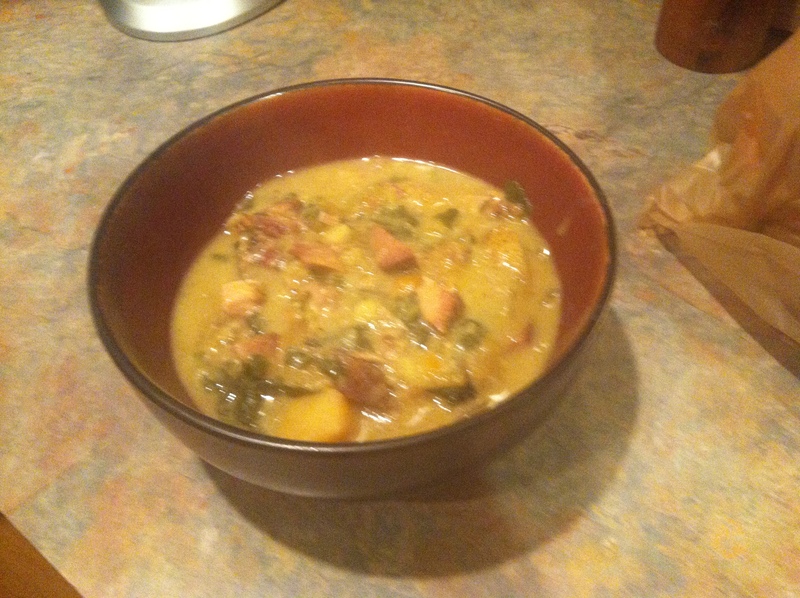 This entry was posted in Recipes and tagged carrots, chard, crock pot, kale, leeks, potatoes, potatos, Winter CSA. Bookmark the permalink. Looks hearty and just right for this cold weather! My kids would notice the turnips. They always notice the turnips. I work with a German gal, and she brought lunch the other day–a beef and sauerkraut . . .stew or soup type thing, with some sort of tomato sauce base. We ate it with a spoonful of sour cream and a sprinkle of shredded cheddar, with a piece of German rye on the side. Delicious! I was thinking that would get my kids to eat sauerkraut–but now I’m thinking of adding some potatoes to it . . . maybe a scoop of mashed in the center . . . Thanks for a new recipe and some further inspiration!